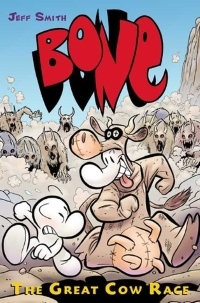 Fone Bone and his cousins plan to return home after visiting the village of Barrelhaven with Thorn and Gran'ma Ben. But Phoney risks everything on one last get-rich-quick scheme for the town's annual Great Cow Race. As usual, Phoney's plans go disastrously awry, and Boneville seems further away than ever. Meanwhile, ominous signs indicate that a war is brewing, and Fone finds himself helping his friends defend their valley from a formidable enemy.